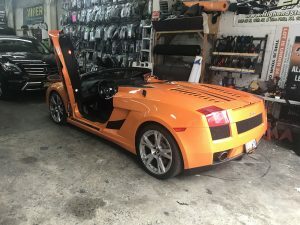 We took this already beautiful exotic car and added lambo doors (was a dealer option on this model). 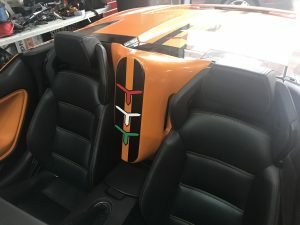 Added Audison Mille components for the front doors with 2 8″ Audison subs with a custom fiberglass box in the center console.We custom painted the console to match and did vinyl wrap graphics to match whats on the trunk area. 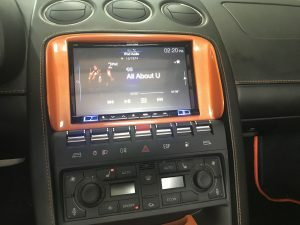 We customized an 8″ Alpine X108 mechless head unit. 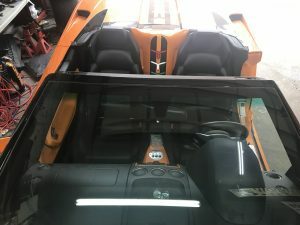 We fiberglassed the bezel and also factory paint matched it. We also added a Black vue video recording device for 24-hour surveillance recording. 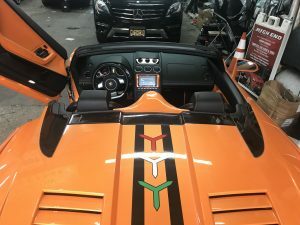 We tinted the vehicle and added a Viper alarm system.